Call for Applications: Activist-in-Residence Program, Due November 1, 2018 by 5 p.m. Applications are closed and we are pleased to announce our first Activist-in-Residence: Isaí Ambrosio. Read more about Isaí's residency. 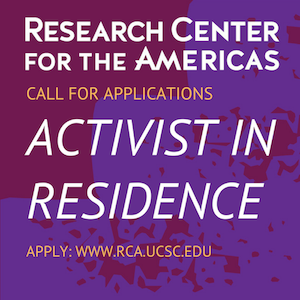 UC Santa Cruz’s Research Center for the Americas (RCA) is proud to announce a new initiative: the UC Santa Cruz’s Activist-in-Residence Program during 2019 Winter quarter (with the possibility of extension through Spring). The RCA has a commitment to bridging Santa Cruz County communities and the university through public scholarship and service. We see this residency program as an ideal new opening in which to introduce new collaborative opportunities for faculty and students with local community leaders. Be 18 or older; live and/or work in the Santa Cruz, San Benito, or Monterey counties; and not be a current UC Santa Cruz university student or employee. Be available part-time during the residency period for 9-10 hours per week (which can include 1 hour of Office Hours per week). Currently works full-time or recently held a leadership position at a community group or government agency that works for underserved low-income, immigrant, and/or communities of color. Proven commitment to working for progressive social change and social justice. Be interested in building a cross-disciplinary network of leaders and scholars affiliated with UC Santa Cruz. Present a clearly articulated project statement about what the applicant hopes to gain from the residency and what issues the applicant would like to explore. For example, how will the residency be an opportunity for reflection and renewal, in addition to working on and addressing complex challenges facing our community. The RCA understands the identity of “activist” to be defined broadly. An activist can be an artist, a community change maker, an educator, and/or a community advocate. An activist is someone who is committed to social change, to progressive reform, and to strengthening our local community. Too often, activist work is unrecognized, tiring, and demanding. The objective of this residency is to give the selected applicant an opportunity to access university research resources, and have the time and space to engage with UC Santa Cruz students and faculty on their ongoing or future social justice oriented work in line with the RCA’s mission. The hope is that this residency program gives a non-UC Santa Cruz community member an opportunity to be in dialogue with prospective collaborators at the university. Provide the recipient an opportunity to explore or study a community issue that aligns with the mission of the RCA and ways to address the social problem(s) for the betterment of the community. Foster faculty and student participation through (artist/activist) workshops, class visits, community meetings or field research opportunities. Envision future collaborative community engagement projects that can bridge the university-community divide. Increase the visibility of public scholarship or service projects in the community in a wide range of interest areas to the RCA such as (but not limited to) housing affordability, first generation college students, the well-being of the Chicanx/Latinx and immigrant communities, homelessness, and the social inclusion of multiple marginalized communities. Applications are due November 1, 2018 by 5:00 p.m. pacific time. Selections will be made in early December. Please note that the residence cannot be used for the purpose of electoral politics, such as designing a campaign for elected office or in support of a local official. For more information on the residence program, including eligibility and application process, please review the Call for Applications. "Cruzin’: Wanted: Activist in residence," by Steve Kettmann, Santa Cruz Sentinel, August 25, 2018.